on 5/24/2012 @ 6:59am This week's sponsor is Sonic's Guy (local super hero) Kristopher Brannen! He's offering up a $25 Amocat gift card, a Sonics hat, and 2 tickets to a Sonics game the season they come back and suggests a Sonics theme! I'll also add in another $25 gift cert to and donated by the fine folks of Villa Cafe & Imbibery! Weather forecast for tomorrow looks good so we'll see everyone there! on 5/24/2012 @ 4:35pm You gonna be there tomorrow Joel? on 5/24/2012 @ 5:15pm Yup! on 5/24/2012 @ 5:41pm Awesome, I'll bring my money tomorrow. $20 right? on 5/24/2012 @ 8:37pm I'm going! But I'll be sure to vote! 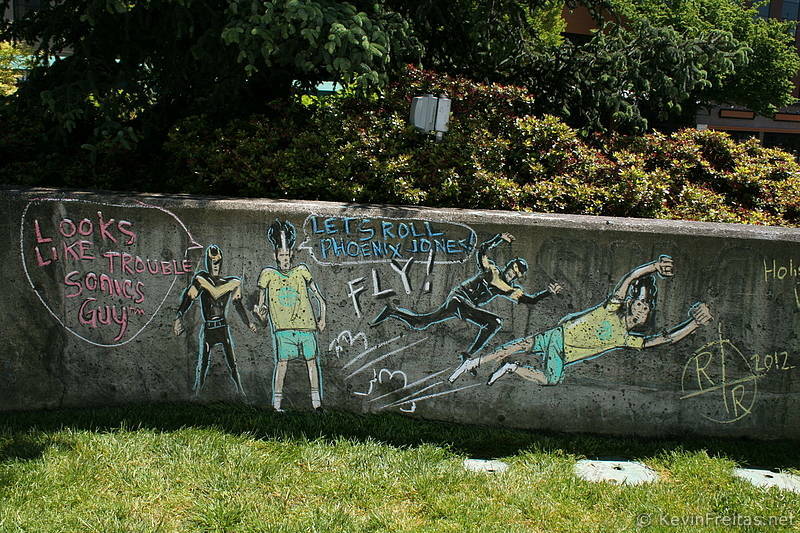 on 5/25/2012 @ 8:37am Whatever, Monlux is just too cool for all us lowly chalkies these days! ;) Miss you Mark -- come back and see us soon! 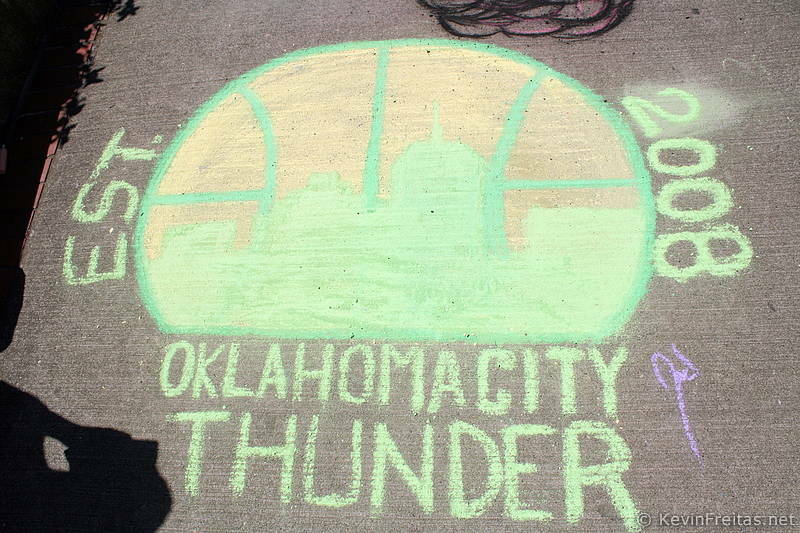 on 5/25/2012 @ 10:34am Weather is looking stellar for today's chalk off. See everyone there soon! on 5/25/2012 @ 11:36am Say, what is this? Yay, Villa Caffe! Robyn and Jason are awesome. 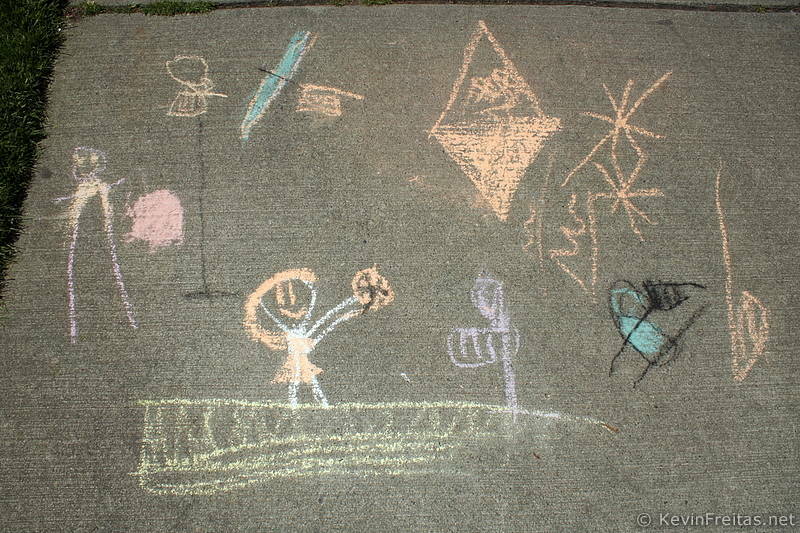 I do miss being able to attend the chalk-offs and seeing you all. on 5/25/2012 @ 1:55pm Here are pics from today's great work! Pick your favorite in the comments below and make sure to use the word "vote" when doing so. Tell your friends! Voting for the Amocat gift card, Sonics hat, and Villa Cafe & Imbibery gift card ends at midnight tonight! on 5/25/2012 @ 2:20pm So how do we vote? We just type who we thought had the best one? on 5/25/2012 @ 2:20pm Madam Mayor Strickland picks Adam the Alien's submission as her favorite this week. Who am I to disagree? Thus, I vote for it. on 5/25/2012 @ 2:21pm I vote Brian. on 5/25/2012 @ 2:21pm @Invader: Just type:"I vote for____________"
on 5/25/2012 @ 2:24pm I vote for Andrea's. Love the blended green colors. on 5/25/2012 @ 2:25pm I vote for Adam the Alien. But um... I'm a die-hard TrailBlazers fan 'till the end! on 5/25/2012 @ 2:33pm I absolutely vote for Brian!! on 5/25/2012 @ 2:52pm I vote for RR, because I make myself laugh. on 5/25/2012 @ 3:02pm I vote for RR. Real-life make-believe super heroes to the rescue! on 5/25/2012 @ 3:22pm So many good ones! I vote for Debivans. I like the Avengers/superhero feeling of this one! on 5/25/2012 @ 4:01pm Great entries all, but I VOTE for Adam the Alien. Great super-hero likeness and a fun Alien incarnation as a hair pick! on 5/25/2012 @ 4:17pm I vote Adam, but wow were there some good ones today! on 5/25/2012 @ 4:38pm I vote for Adam the Alien, from amongst a crowd of great pieces. on 5/25/2012 @ 4:45pm Darn my vote trick isn`t working the little shout out to the chalkies on board the Kalkala. on 5/25/2012 @ 4:48pm the mayor of tacoma has officially endorsed Adam the Alien's Sonics Guy portrait on the facebook. That is a Frost Part First! 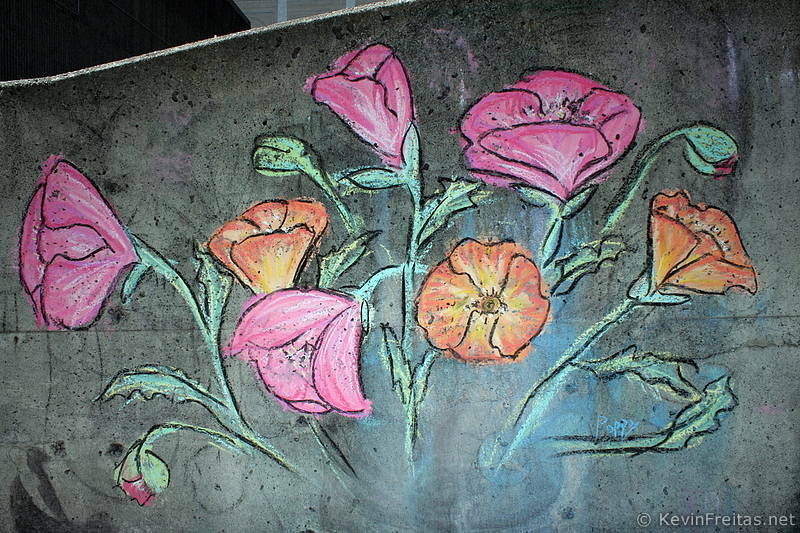 on 5/25/2012 @ 5:08pm I vote for Poppy's flowers. 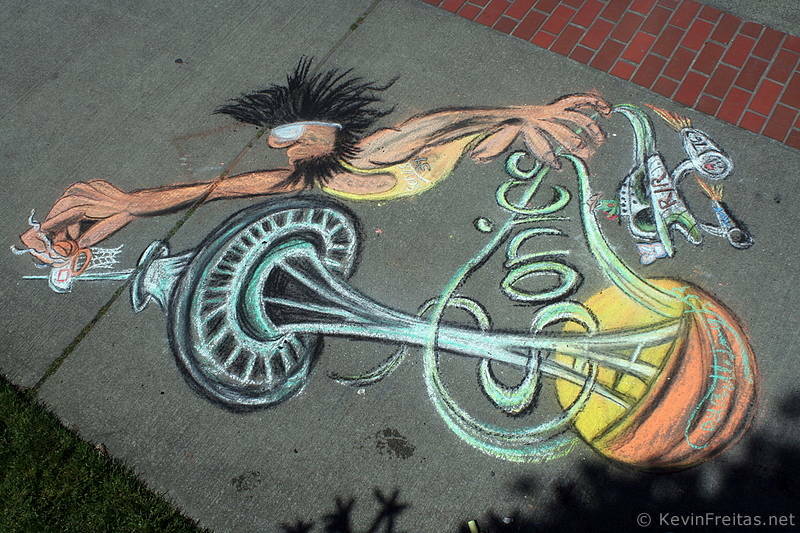 on 5/25/2012 @ 5:19pm I vote for Brian's awesome space needle slam dunk :) Lots of other awesome work too! on 5/25/2012 @ 7:22pm Chalk up my vote for Adam. Great portrait. on 5/25/2012 @ 7:59pm I vote Debivans - awesome art! on 5/25/2012 @ 8:01pm Flying chickens in the barnyard! I'm going to VOTE for RR. on 5/25/2012 @ 8:09pm There's sumthin about that Sonic Squid...I vote for Troy. on 5/25/2012 @ 9:10pm I vote Troy! on 5/25/2012 @ 9:38pm So hard to choose! Great work out there today. I love Andrea's wicked green b-ball, Brian's awesome space needle action shot (with props to RR's Star Kalakala! ), Poppy's flowers were just plain lovely (and cracked me up since she hates pink! 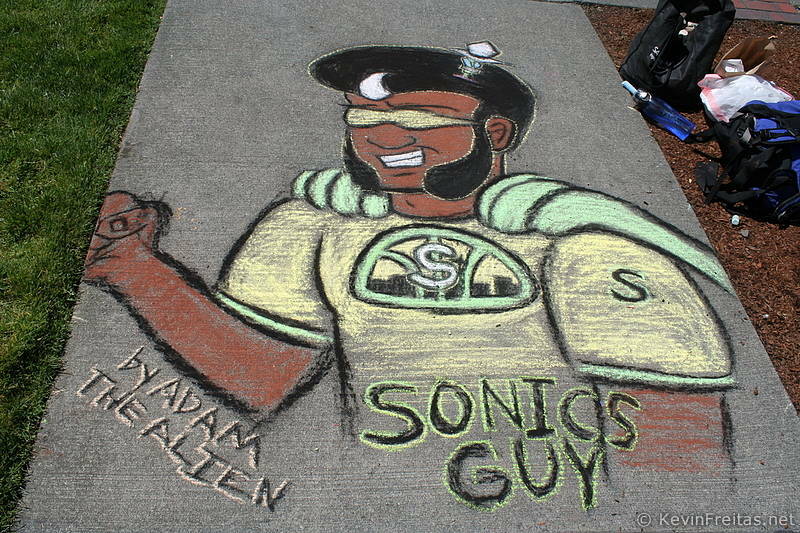 ), and Adam's likeness of the Save our Sonics Guy is right on. My vote this week goes to Brian! Great to see everyone and a huge welcome to chalk newbie Misfitt! See everyone out there next week! on 5/25/2012 @ 10:04pm So much fun.. but who to vote for... I think this week I am going to VOTE for RR. Too many good choices and so many worthy pieces. on 5/25/2012 @ 10:22pm I vote for Brian. He did an awesome job. on 5/25/2012 @ 10:23pm I vote for Brian. on 5/25/2012 @ 10:31pm If its endorsed by the Mayor, I have to VOTE for Adam. on 5/25/2012 @ 10:37pm I vote Adam. Sonics guy is a true Superhero. 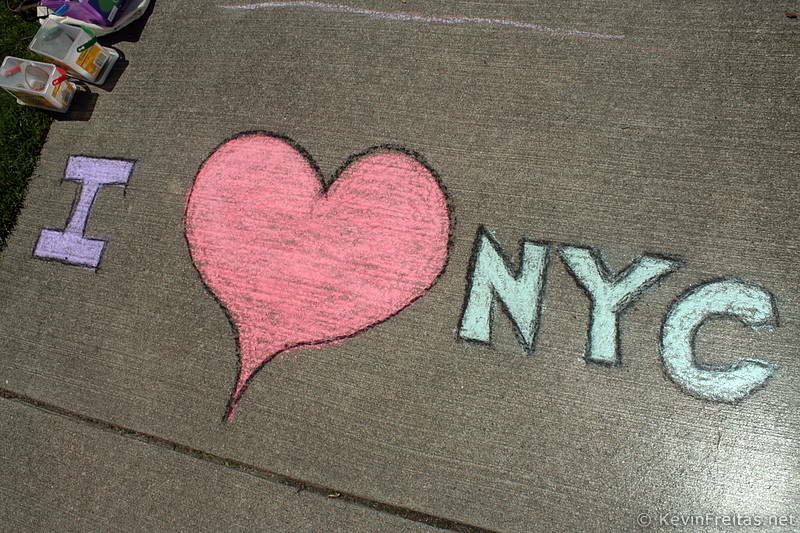 on 5/25/2012 @ 11:01pm Thanks Gini for the chalk today, that was super nice buttery chalk I got to get my Prang fix now. I`ll see everyone in a couple weeks back to Cali for work. Oh yah I must vote for myself tonight before I sign out. Chalk at all you Chalkies L8ter. on 5/25/2012 @ 11:47pm My vote this week goes to Adam! on 5/25/2012 @ 11:51pm I vote for Brian! on 5/25/2012 @ 11:53pm Wow! A show down til the bitter end!! on 5/25/2012 @ 11:56pm Ha Adam that`s two years I put you in that pilot seat until next time will chalk again . on 5/26/2012 @ 12:05am Will meet up for coffee some Friday my treat and a ride to where the Alien goes after word . on 5/26/2012 @ 12:48am I'm late, but it doesn't even matter - because I like them all, even those with no votes. 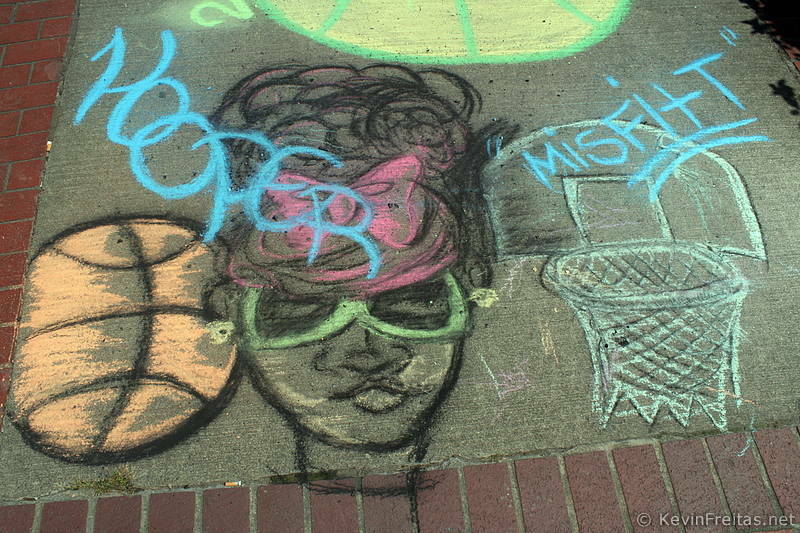 on 5/26/2012 @ 2:33am This was my first time down to the Chalk Off of Tacoma and I had a lot of fun watching, talking to folks, & taking pictures. I didn't understand the voting mechanism & couldn't find this at first, so I can't cast a vote that counts, and it's also a tough call. 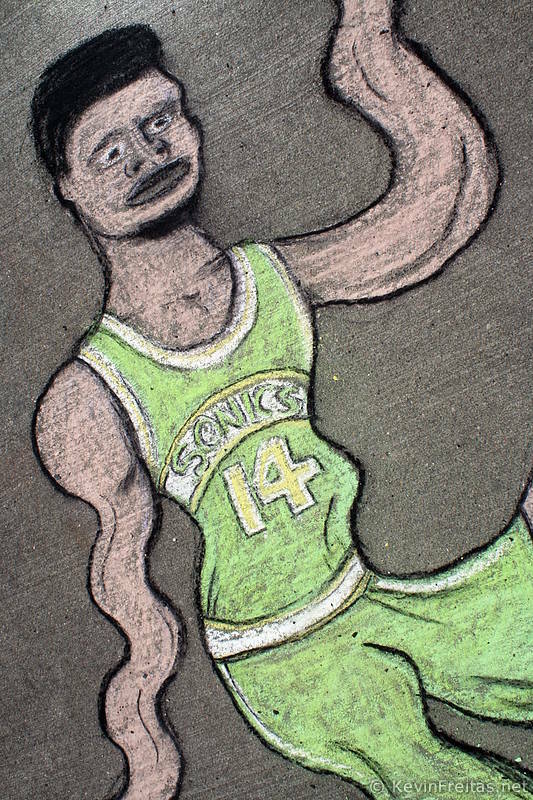 I thought that Debivans Wavy Big Smooth Portrait of Sam Perkins was quite impressive and the only actual Sonics player that was drawn. Andrea's Angry Sonics Ball was quite incredible for the amount of emotion that she packed into that Sonics Ball. He is like a Lover Scorned and he is going after someone - probably Howard Schultz for being the Benedict Arnold that he is and screwing us all over by selling our Beloved Sonics to true Aliens in Cowboy Hats. That Ball is leading the Starbucks Boycott Forever! I'm a little surprised that Andrea didn't get more votes. I really like Brian's dunk above the Space Needle. I think that may be a different version of Sonics Guy. Poppy's Poppies were very pretty. 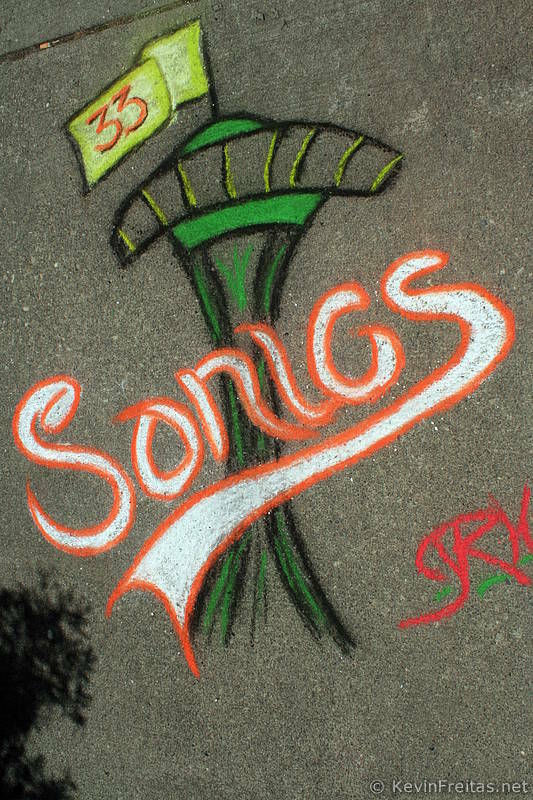 Gini's drawing is pretty simple (not for me), but I really like the way the "Sonics" pops out on top of the Space Needle. 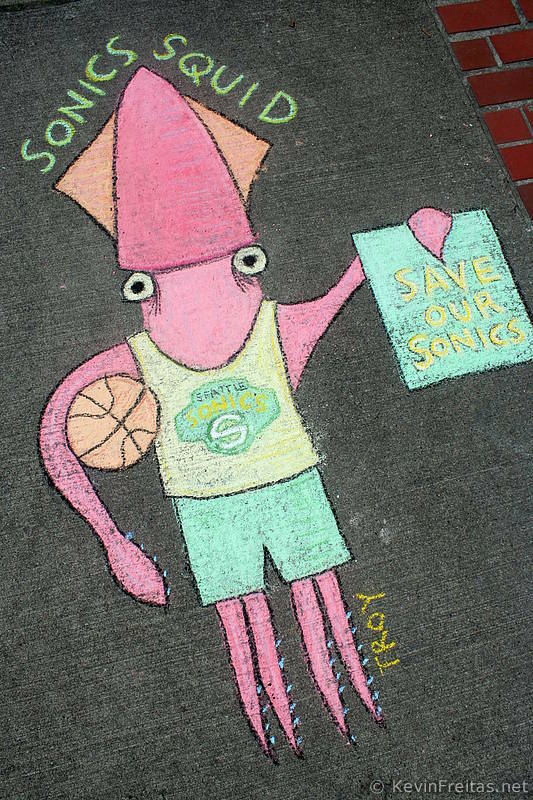 Troy's Sonics Squid was cute and fun. 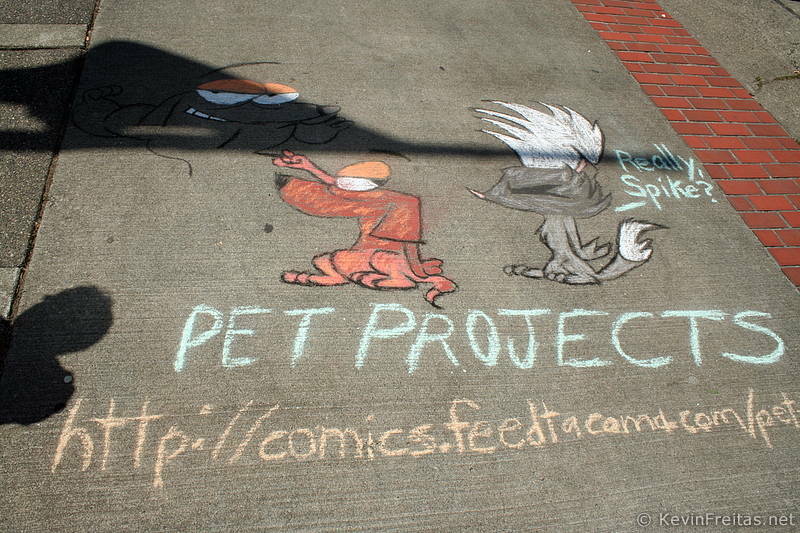 I must say that MisfitT's drawing is more impressive in the photo than I remember it looking. 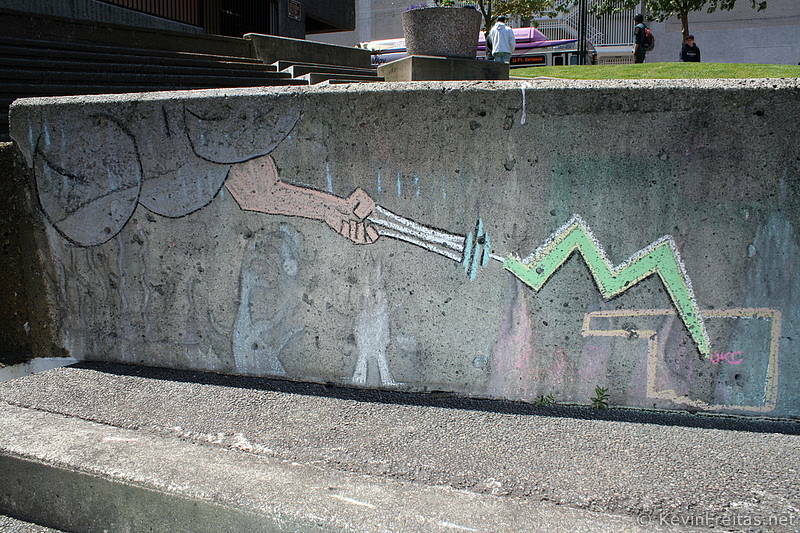 On the other hand, I really thought that Matt's drawing of a Sonics Warrior Smiting OKC with a lightning bolt from the Space Needle was more impressive in person than it is in the photo. I did like Ariel & Lady's Sonics Rally Cycle very much. It's a great motorcycle. 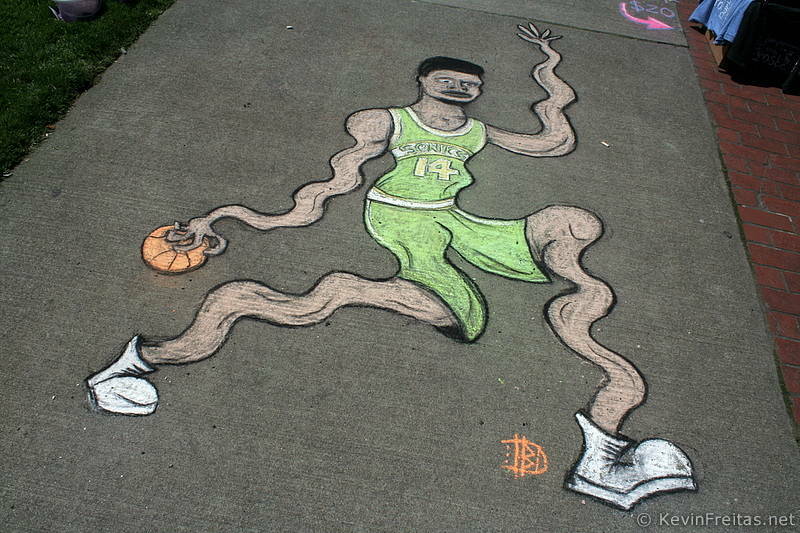 The Alien Adam's large drawing of Sonics Guy Kris is certainly impressive. 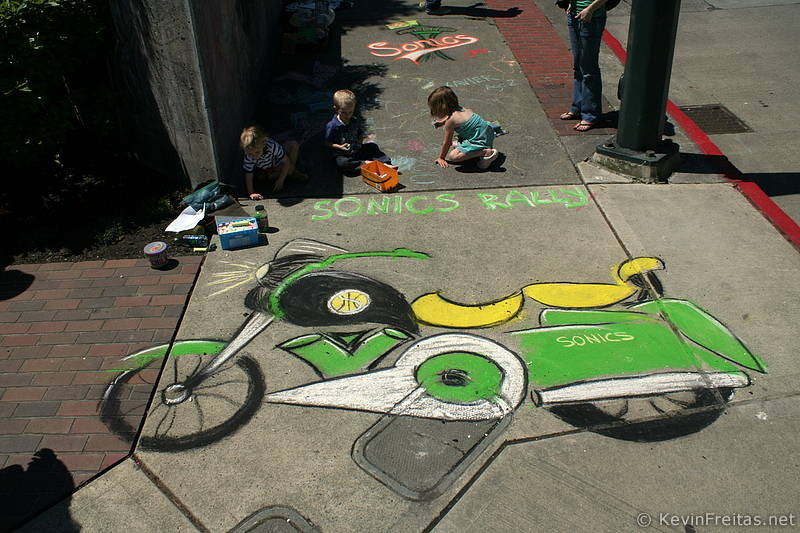 He is the Creator of the Cartoon Sonics Guy and maybe the flesh-and-blood Sonics Guy, too, so he should be able to draw him well, but that was really good chalk art! 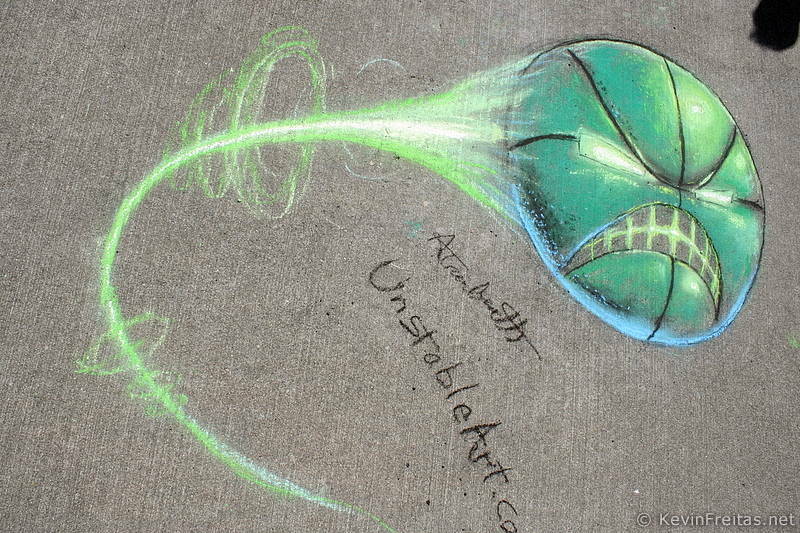 When it comes down to it, though, I would have cast my vote for Andrea of UnstableArt.com because of the beauty and raw emotion in that piece. And I really love watching Andrea chalk - very different. But just look at her piece again - look at the pure rage going on there -- that's exactly how the average Sonics Fan felt and still feels to this day at how we were all screwed over by Mr. Starbucks & David Stern & the rest of them. 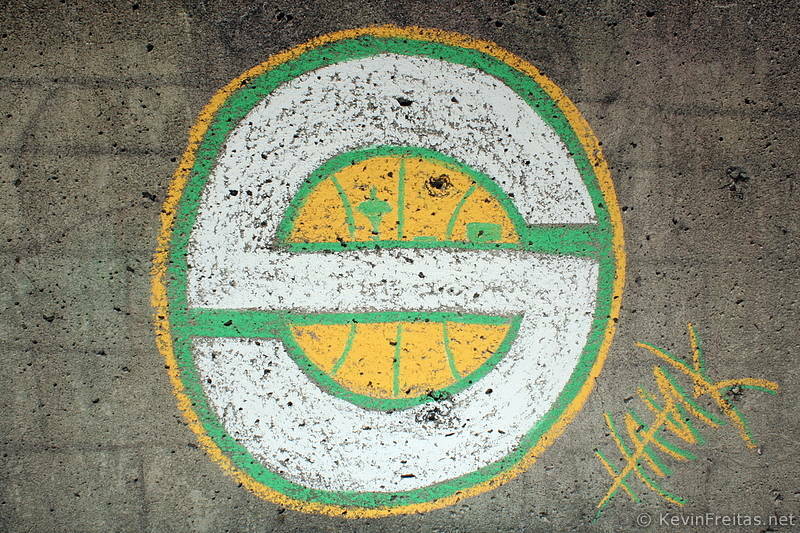 Now for a shameless plug for my group: BRING BACK OUR SONICS on Facebook & @BringBackSonics on Twitter. Kris Brannon is also a member of this group. We are having a SONICS NIGHT at Cheney Stadium on June 27 starting between 6-6:30PM & going until 11:00PM with the concert after the Rainiers game. Tickets are available on our website www.BringOurSonicsBack.com or from Kris or I in person. $20 for adults & $15 for kids 14 and under for a great night of entertainment and family fun. We'd love to see you there. I'd like to thank Kris for inviting me to this Chalking Event. on 5/26/2012 @ 4:57am Wow! Great commenting ZenDoc, I hope you continue to check in on Fridays and cast a vote in the future. Your critique points are impressive and your opinion seems unbiased and true. Nice! Go Sonics & down with Zombies! on 5/28/2012 @ 5:24am debivans-anagram of Ben Davis. You can still vote every Friday online.